Visionary Charleston chef Sean Brock traces the origin of low-country dishes like hoppin' john and gumbo back to Senegal, emailing his restaurant cooks from Dakar so they can update his recipes in real time. Chef Sean Brock is in Dakar, sorting cowpeas in the apartment of Senegalese home cook Fati Ly. Brock is wearing his "Make Cornbread, Not War" baseball cap. "You have to get me one of those," Ly tells him. "I love that message." The Charleston, South Carolina-based chef laughs at her request without looking up from the handful of speckled gray peas he's holding. He's mesmerized. "I've collected more than 300 varieties of peas back home, but I've never seen most of these," he says. "They were probably grown once in the South but got decimated by hurricanes and the Civil War." 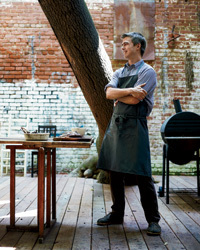 As the chef at McCrady's and Husk in Charleston (and a new branch of Husk in Nashville), Brock is one of the loudest voices in the Southern culinary revivalist scene—he's attempting to bring back not just the dishes, but the pig breeds, heirloom vegetable varieties and near-extinct grains of the region. At McCrady's, Brock fuses a traditional Southern larder with the mind-bending techniques of modernist cooking. At Husk, which opened in 2010, he burrows into the past of what's called low-country cooking—named for the coastal regions of South Carolina and Georgia. In his quest to re-create the pure and authentic version of low-country cooking at Husk, Brock has collaborated with historians, plant geneticists and farmers to revive some long-forgotten foodstuffs. At a certain point in his research, Brock realized that he needed to follow the trail further back than Junior League cookbooks or vintage menus could take him: across the ocean, all the way back to Western Africa. It's this passion for culinary history that has brought him on a nine-hour journey from his home in mellow, manicured Charleston to the chaotic metropolis of Dakar, the capital of Senegal and one of the centers of the slave trade in the 18th century. "The contributions of Africa to beloved dishes like gumbo, jambalaya and collard greens are monumental," he says. They are dishes born of the terrible legacy of slavery that, as he puts it, "need to find their true voices again." For Brock, this isn't a mere academic exercise; he's rooting around for culinary inspiration. Over the course of his trip, Brock visited the kitchens of three different women to see how Senegalese cooks go about making some of his favorite dishes: hoppin' John (a stew of rice and black-eyed peas), collard greens and more. 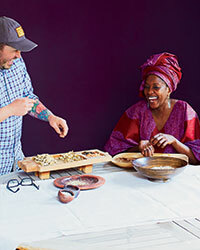 Then, back in his kitchens in Charleston, he created his own hybrid South Carolina-meets-Senegal versions, finding substitutions for some of the more esoteric Western African ingredients—say, fermented locust beans. Throughout his visit, Brock was scribbling down notes in a red book and communicating with the cooks in his kitchens back home, sending them changes to menus in real time. At one point, as he watched Ly steam rice over a pot of aromatic broth to infuse it with flavor, he cried out, "Genius! Why don't we do this?" He then promptly emailed his sous chef to tell him about it. "I would love to see what I've learned here not just on my menus, but on low-country menus everywhere," he says. "Western African traditions have shaped one of the oldest cuisines in America, but as we modernized these dishes, they lost their soul. We owe it to both Southerners and Western Africans to find it back again." Brock and Ly meander through a maze of honking cars and scorching hot sidewalks to the city's Sandaga Market to collect additional ingredients for the day's recipes. Here, the topsy-turvy corridors are heaving with local foods. To an American, many are wildly foreign: nutty red palm oil; fonio, an ancient variety of millet; shea butter; baobab pulp and juice, made from the pods of the gnarled baobab tree. But then, some seem quite familiar: Vendors sell hot roasted peanuts and a local clove-and-black-pepper-spiked Touba coffee that reminds Brock of the chicory coffee back home. He immediately notices that the market is missing one key Southern staple: pork. Most Senegalese are Muslim, so they don't eat the stuff; instead, they use fermented and smoked fish to bring umami, smoke and intensity to many dishes. It's hard to imagine Southern food without pig, but by the end of the trip, Brock is hatching schemes to start fermenting oysters, smoking catfish and drying shrimp to bring new flavors to his core repertoire. On the last afternoon in Ly's kitchen, after days of cooking and discovery, Brock explains his urgency to learn as he fries black-eyed-pea fritters called akara in bubbling peanut oil. "Cuisine is two things, culture and ingredients," he says. "You have to keep both alive." Ly mirrors Brock's somber expression as she nods in agreement. He continues, "Making this connection keeps the narrative of both traditions alive. 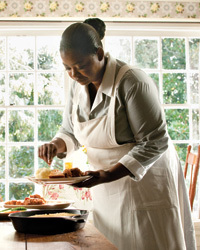 It brings us together, and forges an understanding that has the potential to change low-country cooking forever." For a few moments, the two cooks stop frying fritters and look at each other with a shared furrow on their brows. The room is silent—but then they break into laughter. As she hands Brock a strainer, Ly says, "We are serious people. But we are happy inside." New York City-based writer Jody Eddy is working on a cookbook with Icelandic chef Gunnar Karl Gislason for 2014. A classic one-pot rice-and-meat dish, purloo is "the low-country cousin to jambalaya," explains Brock. Cooking with Ly and her mother, Sophie, Brock makes a "white version," without pork or tomatoes. Brock is amazed by one of Ly's innovations: After the shrimp and fluffy rice are transferred to another bowl, she scrapes out the caramelized layer that forms on the bottom of the pot and sprinkles it on top of the dish as a crunchy garnish. "Purloo game just changed," Brock says after trying it. "The crunchy rice has got to be there from now on. "Every culture has its own incarnation of rice and beans," says Sean Brock. "You only begin to understand what a person is all about after you've tasted their version." Fati Ly and her friend Kady Touré cook the Senegalese take on the dish, called thiébou yap ak niébé, at her home on a quiet side street in Dakar. (Their version also features squash and carrots.) What's most incredible to Brock is that the dish has a rich, deep flavor, but no ham or bacon—most Senegalese are Muslim and don't eat pork. Ly uses smoked fish and fermented oysters instead. Fati Ly's mother, Sophie, brought a large bunch of freshly picked moringa greens into Ly's dining room. "These used to grow in the backyard of every Senegalese home," says Ly. "Today the tradition is disappearing, and it's a shame, because moringa is so healthy and flavorful." Moringa is called nebedaye in the local Wolof language, an iteration of the English phrase "never die"; it's a nod to the plant's famously sturdy and vitamin-rich properties. To dress up the simple braised greens, which have a tangy bite reminiscent of radishes, Ly adds raw peanut powder. In his version, Brock adapts a technique he learned on a day trip to Gorée Island: The raw peanuts are buried in blazing-hot sand inside a cast-iron pot. "They have an incredible earthy, smoky flavor," says Brock. On his last day in Senegal, Brock settles into an open-air grill restaurant and sports bar called Seoul II to watch a traditional Senegalese wrestling match. Brock is nearly as obsessed with wood grilling and barbecue (not to mention wrestling) as he is with low-country cooking. On the menu: wood-grilled goat, lamb and pigeon, served with the local beer La Gazelle and a fiery hot sauce called kani. 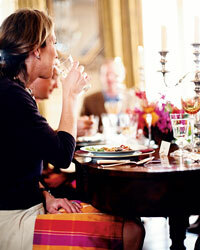 Every table has a large bowl of mustard onions on it—simply raw onions marinated in mustard and vinegar. Brock loves the crunchy, tangy onions so much that he now serves them at Husk all the time. "I can find virtually all of these plants in Charleston," Brock says as he strolls through the garden at the family home of Amsy Mathiam, a human-resources manager and an incredible home cook. Mathiam's father was the Senegalese ambassador to Sweden, and she spent much of her childhood in Stockholm, but her mother made sure she learned to cook traditional Senegalese recipes. Today, she is teaching Brock how to make something called soupe kandia—what he knows as gumbo. "Though it doesn't use ham or tomatoes or a roux, the look and texture are the same," Brock says. The red color comes from palm oil and the thick texture comes from smashing the okra into a paste. Mathiam's seven-year-old daughter, Yasmine, pounds the okra with a massive wooden pestle that's nearly as tall as she is. "My daughter helps me, and little by little, she learns to cook," says Mathiam. After cooking, Yasmine and her brother, Saleem, ask Brock to roll up his sleeve so they can check out the tattoos of vegetables that cover his left arm. Yasmine is able to identify nearly every one of them. She marvels, "It's nice that you eat the same things in America that we do in Senegal." This spot specializes in traditional dishes (like yassa, or chicken with rice) and juices like sweet hibiscus and tangy baobab. 56 rue Saint-Michel. Locals come to this tin-ceilinged sports bar to watch Senegalese wrestling, and to eat the grilled lamb skewers with tangy mustard onions. SICAP Karak.